Revenue from the Telecommunications, Audiovisual and Internet sector in 2010 represented 3.7% of Spanish gross domestic product. The weight of the Telecommunications sector showed similar values in the last years: from 4.5% of the GDP in 2005 (maximum value of the last 5 years) to 3.7% in 2010. Retail and final telecommunication services accounted for 3.1% of the gross domestic product and remained at similar values over the last five years: from 3.6% in 2005 to 3.1% in 2010. 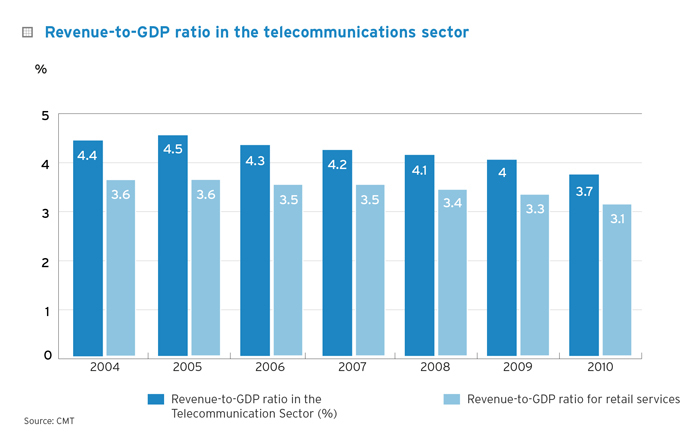 Telecommunication sector's revenue as % of Spanish Gross Domestic Product.